I was talking to my father the other day. On top of exchanging the standard pleasantries, news, family gossip, and such, the conversation turned deeper than expected. I found out some new truths about my past. I always used to tell everyone that, some point in history, some distant relative came over from France and Americanized his foreign name, as it was not hip in this country at the time to be from "elsewhere." I've always considered this to be, at least on an aesthetic level, to be a real shame, I would wistfully add, because I could be the significantly more sophisticated "Michel DuBois" instead of the much more pedestrian, klutzy Mike DuBose. Who knows? Maybe the sophistication of my Francophone name would somehow transfer to my pedestrian, klutzy personality, and maybe it would make me just a little more chic, give me a little elan. As cool of a story--and of a hope--as this was, I'm afraid to say it's simply not true, which really bums me out. I blame my fairly distant cousin-type's genealogical obsession. We've found out that, in the Normandy area of France, hoards of DuBois' and DuBoses (maybe peacefully) coexist. 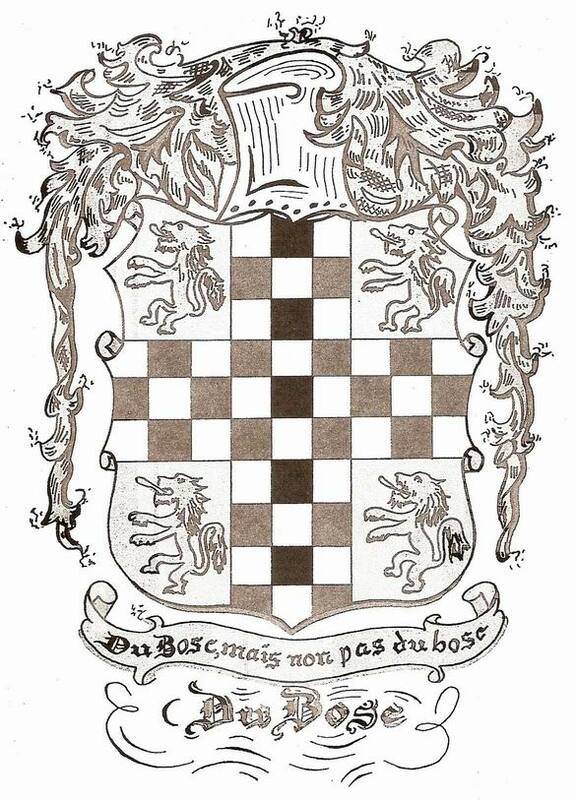 They even have a family crest. Tons of these Viking/Frog hybrids, it seems, came over to South Carolina. The settled around where we used to live. Our South Carolina interlude, it seems, is one of lost familial opportunities, as we were blissfully unaware of our distant relatives living just miles inland. Last October, apparently, there was a DuBose family reunion. Hundreds of them showed up. DuBose upon DuBose. I've always thought of myself as being at the end of my family line. My dad has no siblings. My mom has one brother, but my only personal interest in him is of his suitability as a punching bag. Now, though, right as I (with the slight aid of my pregnant Spousal Unit) am bringing in the next generation, the newest model, I realize there are in fact other versions of the DuBose out in the world, wandering around, making their own impact, all in the services of our quite scattered (geographically, temporally) family. Mark this: with all of us, we're now a force with which to be reckoned. We are invaders, infiltrators, an infestation. my random 83rd Oscar observations.